SOUTHERN PINES, N.C. – Keith Criscoe has been named director of tennis at National Golf Club, where he also oversees the club’s swimming center. Criscoe, a Moore County native, was an assistant pro at Pinehurst Resort and head men’s tennis coach at Methodist University prior to joining the staff at National. Criscoe has dedicated himself to increasing member play, creating more tennis events for members, and providing more clinics. He points out that National has tennis-only memberships available. Criscoe was an excellent tennis player in high school at Union Pines and in college at Methodist. 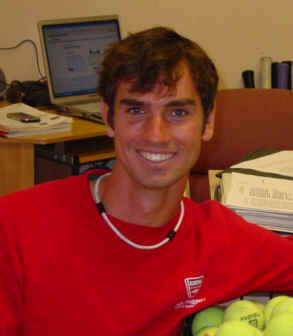 He was the top singles player at Methodist his final two years before graduating in 2006. Another new addition to the tennis staff is assistant pro Dylan Knox. Knox, a native of Lillington, N.C., is a senior at Methodist University and on the tennis team. His duties include teaching, court maintenance and working in the pro shop. For tennis information at National Golf Club, call the tennis shop at (910) 295-5178 or email Criscoe at kcriscoe@hotmail.com.